WindEurope is the voice of the wind industry, actively promoting wind power in Europe and worldwide. We have over 400 members, active in over 35 countries. In addition to wind turbine manufacturers with a leading share of the world wind power market, our membership encompasses component suppliers, research institutes, national wind and renewables associations, developers, contractors, electricity providers, finance and insurance companies, and consultants. WindEurope actively coordinates international policy, communications, research and analysis. We also provide various services to support members’ requirements and needs in order to further their development, offering the best networking and learning opportunities in the sector. 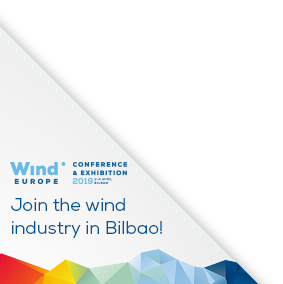 WindEurope analyses, formulates and establishes policy positions for the wind industry on key strategic sectoral issues, cooperating with industry and research institutions on a number of market development and technology research projects. Additionally, the lobbying activities undertaken by WindEurope help create a suitable legal framework within which members can successfully develop their businesses. WindEurope produces a large variety of information tools and manages campaigns aimed at raising awareness about the benefits of wind and enhancing social acceptance, dispelling myths about wind energy and providing easy access to credible information. WindEurope regularly organises numerous events, ranging from conferences, exhibitions, and launches to seminars and workshops. These encourage the exchange of international experience on policy, finance and technical developments, and provide the ideal forum in which to showcase the latest technology.